Latest vehicle for cruising and bruising the bad guys. Rapid fires motorized 30 sewer lid covers. 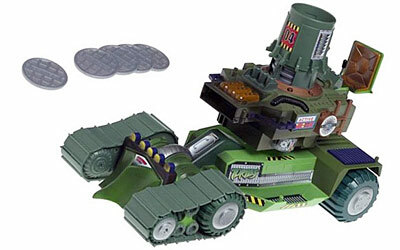 Has room for all four turtles, free-wheeling action, manually rotating turret, oversized treads, tricked-out tank engine, running boards and more. Donatello's latest and greatest mean green machine is a big hit with his brothers. Leo digs driving this bruising beast and controlling its lock and shock lid-launching action. Raph loves how easy it is to rock and roll over the bad guys. Flip your lid for the disc throwing Turtles.